“SEO audits” can mean different things to different people. In general, an SEO website audit identifies issues that hinder a site’s ability to be found in search results and recommends changes to fix those issues. The end goal of a technical SEO audit? To help you improve the site’s search visibility and bring in more organic traffic. But the approach to SEO audits varies across practitioners and agencies. Which approach fits you best depends on many factors. TL;DR: Three levels of SEO audits exist. They all aim to uncover ways to improve a website’s visibility in search. From free tools to an expert’s analysis, all audit types have their place. 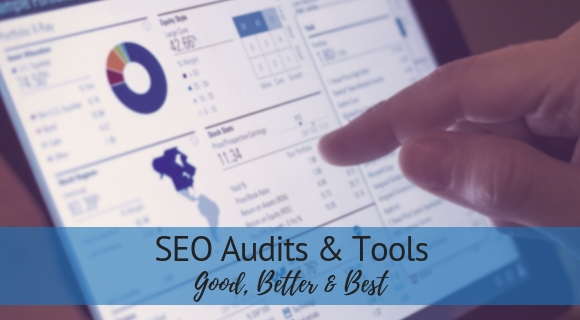 This article lists five auditing tools, explains the different approaches, and clarifies what you can expect to pay and to get from each level of SEO audit. 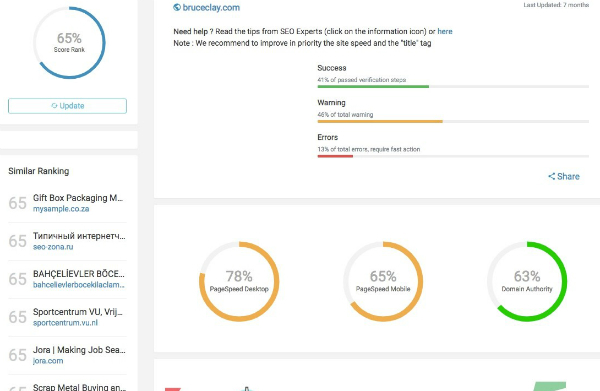 The “Good” SEO Audit: A software tool uncovers superficial SEO issues (many of which may be useful). The tool produces a one-size-fits-all generic report. Appropriate for when you don’t have an auditing budget, or you want to check some basics yourself before starting with an agency. Never a waste, but not a deep dive. The “Better” SEO Audit: An SEO vendor or practitioner offers additional SEO insights but without many solutions. They can identify problems that data analytics alone can’t uncover. Without in-depth solutions, this only points to possible trouble areas, but sometimes that is all you need. The “Best” SEO Audit: An SEO agency performs an in-depth technical audit. It requires the labor and expertise of a seasoned SEO analyst(s) who specializes in technical website analysis and SEO business strategy. This is a manual review supported by tools, and it takes many hours. Of course, you may have different names for each of these levels of audits. Each serves a purpose. However, when all three levels come together in one powerful and “best” SEO audit, you gain a solid understanding of where your website is today, where it can be tomorrow, and what needs to be done to get it there. Let’s start with the most basic SEO audit. Mostly automated, this type of SEO audit uses a software tool. The software examines your website against a set of SEO factors and generates a list of things to fix. Most often, businesses themselves use these tools to do simple self-audits. But this type of audit tends to be superficial. What’s lacking here is the knowledge behind the recommendations. You might receive a brief explanation, but understanding the “why” behind the suggestion can be unclear. Add to that the fact that every business and website is unique. The tool may say “X” is a problem — but is it really a problem for your site’s situation? And how much priority should you give to it? For example, if you’re seeing a traffic loss, a tool-generated report offers no understanding of why. Is there a search engine penalty involved? Could projects that your team is running, like a redesign, be affecting rankings? The self-audit tool doesn’t take into consideration any number of important things that could be impacting your SEO. Still, it does serve the purpose of a quick-and-dirty website review. And you can send the recommendations to your developer team to make quick fixes. Software tools generally contribute to any SEO audit procedure, though the more comprehensive audits give much more insight. Below I’ve listed five software products I like for SEO audit work. They have both free and paid versions, so the price can range from $0 to several hundred dollars per month for a tool subscription. Nibbler is my preferred auditing tool. It looks at everything from on-page factors to back-end considerations, breadth of content, mobile factors, freshness and more. 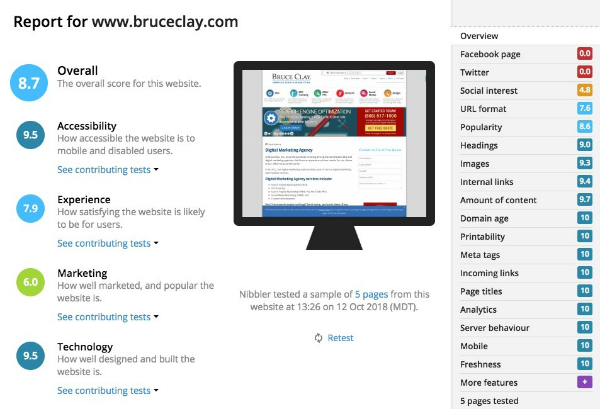 Nibbler’s free version limits you to three reports for five webpages per test. But it offers a paid version that opens up the report to 100-plus pages. This more comprehensive reporting comes in between $50 and $120 per month. SEO-Detective is a free tool that analyzes a site one webpage at a time against more than 20 factors, including Alexa rank, server information, keywords and more. SEOptimer audit data is available in multiple languages and covers everything from on-page SEO factors to usability and accessibility. It prides itself on speed (being able to analyze a site in 30 seconds or less), and allows users to customize and white label reports. Paid plans for SEOptimer run from $29 to $59 per month, and you can run a report for free and download the data when you sign up for a 14-day free trial. 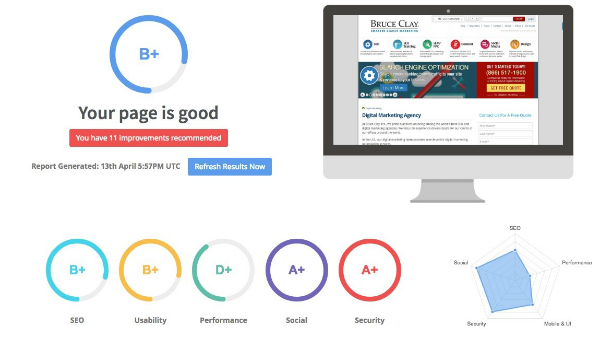 UpCity offers an SEO “report card” that covers things like ranking and on-site analysis including links, trust metrics and accessibility. The report card is a free feature. It’s wrapped into their paid SEO software aimed at agencies at $150 to $800 per month. 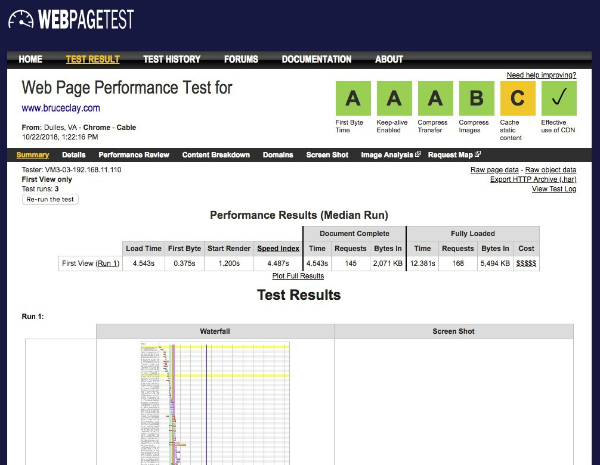 WebPageTest is a free tool that is useful for verifying or identifying speed issues. As you can see, these five SEO auditing tools cover many best-practice SEO tactics. After accessing the data, you should make recommended changes where it makes sense for your website. The downside is that these tools do not listen to your business and website problems, nor do they dive deeper into the data. That is the next level of auditing that I will cover. Level 2 SEO audits are better because they typically involve an SEO vendor or SEO practitioner. Listen to you and learn about your business situation, goals, and past SEO decisions that may be impacting your website. Analyze your Google Analytics and Google Search Console data for more insights. Manually identify SEO issues that are below the surface and not easily recognizable by a tool. This deeper dive can often result in problem identification, sometimes very quickly. You’ll receive important explanations of what’s behind the data uncovered in analytics and auditing tools. Your content is not good enough. Software can only do so much to analyze content (for example, word count or reading score). A human can compare your website content to your competitors’ pages that are ranking in the search results. Such an evaluation can pinpoint where you have room for improvement. Your website design is bad. A software tool won’t be able to tell you that you have an ugly, hard-to-navigate website. It won’t notice that you have a bunch of junk code that’s preventing search engine spiders from doing their job. Having expert eyes on the overall development and design to identify SEO problems is key. Your inbound link profile is poisoned. There are many reasons why a link profile can go bad. A website that has been around for a while has probably had multiple webmasters. During that time, the rules of SEO may have changed, or those responsible may not have understood Google guidelines. Whatever the reason, it’s the SEO auditor’s job to interpret potential spam issues hurting the site. Your server is way too slow. Google cares about how long it takes to get information from your webpage, and says it should display in 200 milliseconds or less. An older study found a correlation between an increased “time to first byte” and decreased search rankings. To clarify, a tool can certainly check page load time. But is the reported load time normal among your competitors? And have you lost traffic due to delays? An audit tool cannot tell you the answers. But they’re crucial to deciding how to prioritize your slowness issues. In a Level 2 SEO audit, the human insights piece makes a great difference if you want to understand major SEO issues impacting the site. If you engage with an SEO vendor, know that the price varies greatly depending upon the issue prompting the audit, site complexity, and the size of the agency’s SEO checklist. Here’s the rub: Most audits at this level are little more than a problem list without solutions. Those fixes are yours to research. Normally, a reasonable “better” audit by a professional as described here ranges from $3,000 to $12,000 (USD). This covers a one-time review; afterwards, the engagement is typically over. You can compare this against the cost and the need to employ an SEO analyst in-house. Each level of audit has its place based on a business’s needs and budget. Luckily, you have options. At the “best” auditing level, you engage with an SEO vendor that has explicit knowledge of how to perform a thorough technical and strategic SEO website audit. You want to choose an agency that makes audits a core business specialty and has enough hours available to do it (up to 100 hours or more). Commonly, a Level 3 audit takes advantage of the kinds of tools I’ve mentioned for the other levels. Tools improve the process. But the “best” SEO audit’s power lies in its expert analysis and strategic recommendations. Expert knowledge. The most comprehensive audit means you’re working with a senior SEO analyst with many years of experience versus a junior analyst doing a more “by-the-book” review. The senior analyst will be apprised of any algorithm changes (known or suspected) as well that may be impacting the site. Competitive research. 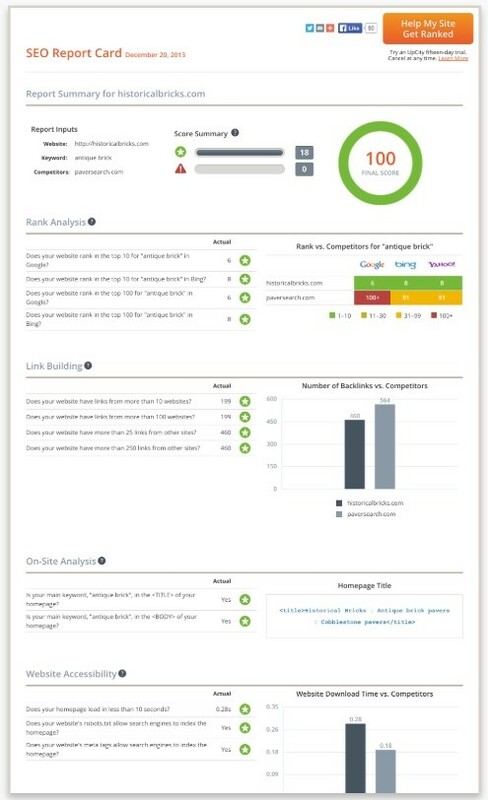 The auditor makes a comprehensive review of not only your website, but also competitor websites. This will help create a strategic roadmap of how to compete in the search results based on those that are ranking already. New opportunities. The audit will include in-depth keyword analysis that will expose new opportunities for search visibility based on a business’s goals. This can be paired with a new SEO-friendly site architecture that works to improve a website’s authority through the structure of its content. Prioritization & guidance. The auditor will not only identify the problem and describe exactly why it’s important based on Google’s guidelines, but also explain how to resolve it. You should receive in-depth instructions on how to implement solutions, complete with a priority list of what to tackle first. You can expect an SEO vendor at this level to spend a lot of time researching and analyzing – sometimes over 100 hours depending on the website – in order be as thorough as necessary. Our search marketing agency mostly does the “best” audits; we also run many auditing tools and tasks internally over the course of every project. Let us know if we can help your business. At the end of the day, all three levels of SEO audits can be useful. In other words, something is better than nothing. Projects on the horizon (for example, a site redesign), and more. In all cases, expect to make improvements to your site following an SEO audit. Bottom line: Making the right changes uncovered in a technical SEO audit WILL help you compete in the search results. I want to know: Have you ever had a “best” level of SEO audit, and what were your results? Tell me in the comments below. Very informative article…you have given good insights to evaluate different tools to suit their budget and requirements. This post is very useful as it made me understand about good SEO audits and tools as it has the ability to improve the online presence of the website and to bring in more organic traffic. Really great article. In this article you describe the importance of seo tool for website ranking.Thank you for sharing such information this information is helpful for seo consultant and digital marketer for rank the website on google. We use “seositecheckup” SEO tools for website audit in free. A rare article about seo audit not just the writing aspects but also many things that need to be taken care for Seo audit when carried out. Thanks for the helpful information on these tools. So far I have been using SEMRush and Ahref. However, I will give a try to these tools as well. What about Ahref and SEMrush? I am using both of them together. SEMrush is helpful for rank tracking while Ahref helps me with backlinks tracking. What are your thoughts? Thanks, Bruce Clay for sharing your good research work, I have been using ‎Screaming Frog from a long time and defiantly in 2019 going to test all tools once. I will share my experience with you. Thanks for sharing the valuable blog. Really SEO Auditing tools is a best practice to know about the lacking points exits in your website. by checking your websites in different 3-4 auditing tools you can review the technical loose points of your website. But its not good to proper depend on tools, you should have to help from these tools but the better way to analyze a website is manual way and hands of experience. because every tools analyze your website according to their criteria. So check in 2-3 different tools for help but lastly do your own review. This is the best. Cool scope you’ve got here. I totally agree “SEO audits” can mean different things to various people. Thanks for sharing the tools that you’ve used. This is a good list of tools. Informative article! I have been using screaming fog and ahref for long time, I feel like it’s time to try new. Having best SEO audit will help to get more organic traffic and generate potential leads. I am obliged for this article. when I used Nibbler, SEO Optimer or SEO detective on a webpage with noindex, I didn’t lose “SEO points” for it :(. Most of the SEO checkers are misleading. That is one of the reasons why I have started to develop new and reliable SEO checker: https://spotibo.com/seo-analyzer. Please, try it :). Hey Bruce, I am currently completely relying on SEMRush & Ahref. Do you think they’re enough or would you suggest me trying something else? I am using SEMrush for keyword research and position tracking & Ahref for backlink analysis. Excellent resource. I have been using Screaming Frog and other tools for a few years. I will give some of these a spin. Awesome post. I’ve been using Nibbler for a long time. I’m glad to see it’s getting some love in the SEO community. The service provided by UpCity is also pretty decent! Thanks for the info. Kas: Thanks so much for your comment! I noticed that you work for the software company you mentioned, so I wanted to disclose that relationship for our readers. Albert: Submitting your XML sitemaps helps to ensure your content is indexed, which is a prerequisite for ranking but not a guarantee. The improvement you might see would be in the number of pages in Google’s index. Check your indexing statistics in Google Search Console. You should also be able to view any sitemap errors there — or maybe discover other items to fix. With your content indexed, you can work on other SEO tasks to help it appear in search results. Take a look at our SEO Checklist for more suggestions. Good luck! I have one audit question I had made All the xml site maps for my website, but i have not found any improvement in my site traffic. i have 500 page website. image,video all site map. can anyone help what to do next? i had submitted to Google webmaster also. The best audit is from a human being with years of experience, but we do not always have time. “This is a manual review supported by tools, and it takes many hours.” Let me check out this “Nibbler” if you say so, Bruce! Thx. Hi Kevin, This is such excellent news! We all appreciate your comment — I have passed it to the SEO team members who worked with your site. Thanks for sharing your success here. I attended Bruce Clay’s SEO classes twice. Then I did a “best” audit for my business. It made a tremendous difference in our web traffic and sales. We are now getting more sales leads than we have in my 27 years in this business.